vrBackupper is a 100% free software to backup Oculus Rift, including apps, games, etc. 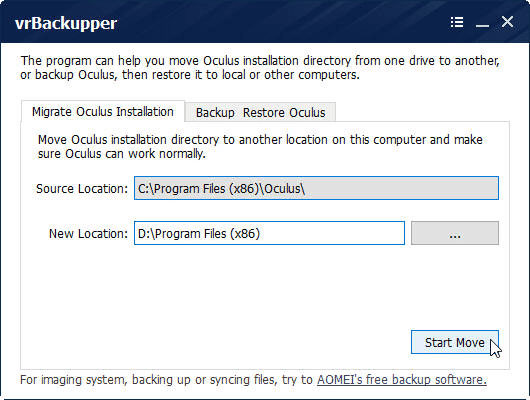 Besides backup, it can also transfer Oculus Rift installation directory to another location. It is easy to use, with it, you are able to solve lots of trouble when using Oculus Rift. vrBackupper is the first such tool in the market. For Oculus Rift users, it is a necessary and useful tool. The idea or say technology – virtual reality is very popular nowadays, there are already many VR games. Many people have enjoyed them. Oculus, one of famous VR producer, developed many interesting VR games and applications. But there has not a backup program to backup Oculus VR data yet. Things changed now, well-known backup software company – AOMEI released vrBackupper for backing up Oculus Rift. 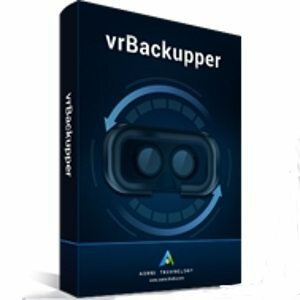 vrBackupper is the first Oculus backup software in the world. vrBackupper has two main functions: Backup&restore and migration. Download, install and run vrBackupper, its main interface as following screenshot shows. Migrate Oculus installation by vrBackupper without re-downloading the files. Migration can be to an external drive, you only need to keep the drive letter same as the original drive. 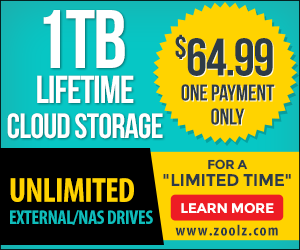 This feature can solve the problem of lacking disk volume. Although Oculus VR games can only be stored in the installation directory of Oculus and Oculus old versions can only be installed on system partition, they are not a problem now. vrBackupper will help you migrate them. 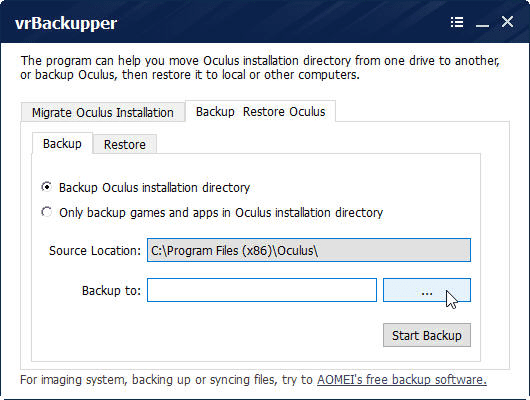 vrBackupper provides two ways to backup Oculuse. One is backup the whole Oculus installation directory, another is backup only games and apps in Oculus installation directory. Restore is also the same. It comes after backup. You can restore to other computers. If you select only VR games/apps on another machine, you should install Oculus on it first. vrBackupper helps to keep all settings the same if you change a computer. vrBackupper is a complete free backup program. We think it’s a functional utility for Oculus users. If you are looking for a tool to protect your data of Oculus, vrBackupper is. Now with vrBackupper, have fun for your VR experience.